guys remember that WP8 support will end on July 2014.
just bing, err.. google it. until ms officially announce future successor of WP8, I'll steer away from any WP phone. anyway, isn't aluminum a good conductor ? last time I got electric shock when connecting my metal-cased phone to dekstop pc..
AnonD-134497, 21 May 2013It actually depends upon the quality. The 8 MP of 920 beats the 13 MP of other brand easily. Agreed. The entire camera module is made from higher quality parts, and the imaging software is what makes it better. Cybershot is old school. Ceased in 2009, and shut down permanently from the mobile division in 2012. There's no legendary cybershot device anyone refers to, either. in terms of camera comparison, only Sony can compete with Nokia, since they have an industry in cybershot camera. but i think even sony camera phone lose in terms of photo features and quality. the carl zeiss optics really help. Come on guys, the OS is still fresh. even the early android doesnt have a flash player or customization. or doesnt support other browser. wp8 will evolve, it will support those things. microsoft have no choce but to make it slightly open os. just like their windows in pc. On the first page should be 46 grams lighter, not 36 grams. Always on clock is cool, FM Radio is back too, put a SD Card and HDMI in the EOS model and it will easily replace my 808 (if the photo quality is at least on par with 808). AnonD-133243, 21 May 2013if 8mpx is better than 13, is then 1.3mpx better than 8? And then, is vga better than 1.3mpx? ... moreIt actually depends upon the quality. The 8 MP of 920 beats the 13 MP of other brand easily. Apart from screen resolution comparing other specs WP vs Android phones really does not make sense. Are those latest android flagships significantly faster than Lumia? No not really. Sometimes they still lag. Owning Lumia 920 I wish there was a possibility to install flash and make IE a bit more functional. Other than that I'm absolutely content. Windows Phone 8 seems like the best choice for a mobile phone right now but it really depends on what you like or what you need. People keep saying that the Windows store doesn't have a lot of apps. Well so... many of the apps a person downloads only get used for a week anyway. Also people keep saying that the processor on this phone is weak; the processor isn't weak. Nokia just doesn't need to put a heavy processor in a phone that runs a smooth OS. Don't compare WP8 to Android because Android lags and needs a lot of memory and a heavy duty processor. Don't compare WP8 to iOS because it has a much fresher look than iOS and it works just as smooth. I think if people just try WP8 with this Lumia instead of just wanting what everybody else has they would really see how easy WP8 is. Looking forward to the full camera test with photo quality comparison. Mark, 21 May 2013Only lamers think 13 megapixels is better than 8 megapixels.if 8mpx is better than 13, is then 1.3mpx better than 8? And then, is vga better than 1.3mpx? Ok, i'm going for a nokia 7650, lol. The phone is quite expensive. However everyone has to understand something (this includes the guys at GsmArena). To say that this phone is worse than the competition because it does not have a 13MP camera and an 1080p screen is accurate. But to say it is worse because id does not have a quad-core CPU misses the point. WP8 is resource-efficient unlike the power-sink aka Android. Competitor phones need huge CPUs because of Android. The Nokia 808 only needed a single-core CPU to record full-HD. So don't go saying it is underpowered, because it's not. A dual-core is more than enough for WP8, and it's battery-saving too. AnonD-147377, 21 May 2013Is this the phone that took you a year to build? A downgrade version of Lumia 920!this is only for user choice.. not replacement of 920.
Who want thinner lighter go for this. For a cellphone that costs more than the S4 it's very poor on processing power. "Windows Phone 8 can also be controlled by voice only - you can dictate or have the phone read text out, you can initiate searches and so on. Other OSes are doing it too - Android's got Google Voice Actions, Apple has Siri and there are a number of third party "virtual voice assistants" available. The Windows assistant though is still far behind the competition." Siri, and Gnow are great Virtual Voice Assistants. 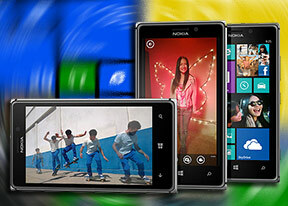 Some are also coming on the WindowsPhone, like Maluuba or Indigo. But TellMe is no voice assistant, it's Voice command. And as such, it's worse AND better then Siri or Gnow. It's worse, because it's harder to showoff without using thrid party app, and you won't get an educated answer to questions you'll ask to your phone. Siri and GNow are actually trying to communicate with you, and as such, are very cool and useful tools. But it's also better, because TellMe is designed so developpers can add their KeyWords directly in the Lexicon of the phone, which means you can pilot the phone AND the apps entirely with your voice, when the developpers code their app correctly. Take a look for example to the HeyDj application. Which is a whole new dimension that Siri and Gnow cannot compete with, and its application are as practical as the few ones you can see advertised for both services. AnonD-27765, 21 May 2013You want static icons? I assume you're using an iPhone. Too bad Apple is going the flat UI des... moreNope. I'm not an Apple fan. I'm using HTC One FYI. And what's wrong with static icons? I can just tap and launch the app, who cares about all the irritating flipping? Android has an excellent notification system all consolidated on the notification shade. Unlike WP, no pinning of tiles = you receive NOTHING. LOL! PAT, 21 May 2013Are u loosing sleep because of WP. My advise is just throw away.Throw? Why throw when I can sell it away? LOL!